Welcome in the anti-music. In the non-rhythm where the seconds are being eaten away utterly by some baroque pulsations, breaths and resounding howlings to be made turn pale the winds of Black Storm. 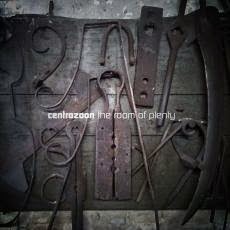 Built around the tour which paid a tribute to the works of King Crimson, just as the last solo album of Markus Reuter (Sultry Kissing Lounge) moreover, “The Room of Plenty” from Centrozoon is a musical exercise totally dedicated to those who are aficionado of a very experimental music which transcends the own empirical territories of King Crimson. Here, there is no concession at the melodic approach. Everything is sound! Both in the fuzzy rhythms as in the tortured atmospheres. The only exception being the very short "Plaan". As for the rest; get your ears sharpened well! Nevertheless the vaporous waves of Markus Reuter's Touch Guitar which open "Paalm" let guess a warm work. As soon as the strange organic noises, one would say some deformed snores, invite each other and get in through the heavy resonances and dissonances of the guitar, we are diving into the most total of the abstract universes where the explosions of sounds irradiate some sonic clouds filled with static anger. If we find the introduction of "Paalm" too brief, "Dooom" makes adjustment with soft guitar chords which roll in more peaceful winds. But as the seconds pass, "Dooom" aims to justify its naming. And it's not because there is no tempo, or something like it, that it's not violent! The winds roar like in the best moments of Stephen Parsick's Permafrost series with a subtle gradation, a horrific crescendo in this ambient movement, where we imagine easily that the roots of the insanity take life through these violent metallic hummings. "Aarooma" is a slow symphony that we guess to be about agony where every breath, every plot of air is stigmatized in a metallic envelope which scratches the hearing. One would imagine to be in a factory of sounds of which the purpose is to produce the most distortions in an acceptable surrounding. Moreover we hear machines roar with pleasure. As well as the conveyor which enjoys to make lug around a collection of quirky tones which, put in a crocodile line, will eventually sculpture a rather surprising passive rhythm. The sounds? I hear a thick cloud of bat laughing till they cry and spinning around such as a gigantic tornado which decimates trees of huge roses where every thorn tears the stratosphere. The percussions? Although Bernhard Wöstheinrich and Tobias Reber are busy to create the parameters of abstract rhythms, the percussions whisk more the ambiences with tones which inspire a euphoric state of discomfort. At this level "Hoorn" is rather impressive, especially with the voice which shouts as a torture in a hallucinating ambiosonic envelope. These percussions remain quite static and serve as decoration, of staged to ambiences which touch the walls of a very underground civilization. One loves "Aarooma"? Well we are going to adore the resounding "Brooom" which is more musical and which sounds so much as a King Crimson dirtying the walls of their studio with muddled ideas which quietly will take shape. Even if apathetic, it remains the most serene track, except for "Plaan", in “The Room of Plenty”. We could say the same thing of "Woortex", except that it is a little more, I say well a little more, livened up by a rhythmic life all the same rather passive. "Tooong" concludes this symphony for iconoclastic noises with long lamentations of a skinned guitar which float, and eventually roar, between the floating lines of synths as much ambient as surprisingly more musical. If I had a track to choose for playing on radio, that would be that one! This says enormously on this album which is for ears fond of tones of which the charms live for sure in the gaps of the antimatter.